Since then, Christina has gained more than a front tooth, enjoying success around America and in the UK. She has recently made her West End debut in Forbidden Broadway, the show she credits as being her big break when she appeared in the New York production six years ago. When she’s not performing in musicals, Christina stages solo shows in the US and UK where she sings as herself and shows off her array of impressions, although she is more comfortable doing the former. “I’m much more confident singing as myself than I am doing an impression,” she confesses. “I always say I’m very proud to do impressions. I really do love it and I don’t dislike it if somebody calls me an impressionist, but I am a singer first and foremost and I won’t be able to do these impressions if I didn’t have security in my own voice. With so much variety to cram in, she may be busy on stage, but behind the scenes she prefers a more mellow atmosphere. “It sounds so cheesy but I love to read. I love books and bookshops and libraries,” she says with a laugh. “I have to say I’m an unapologetic Jane Austin fan, so here I think I might get a train to a park and go and sit and read some Jane Austin. That would be a perfect, typical Anglophile thing to do, it’ll be great. 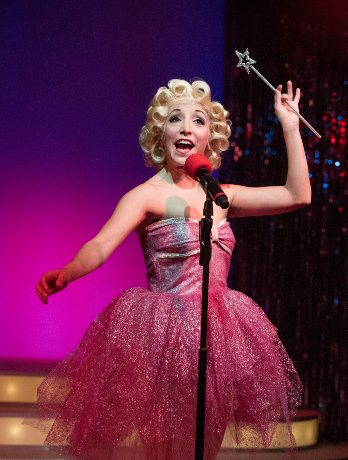 Christina is performing in Forbidden Broadway until November 22 at the Vaudeville Theatre, London. You can read our review of Forbidden Broadway here and her solo show Party of One here.